To purchase any of these issues, visit the Ordering Page. 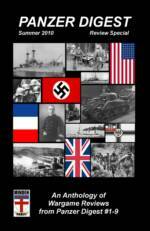 Each issue of this Charles S Roberts Award winning magzine includes complete wargames emphasizing playability and historicity, plus great wargame reading and reviews. This 48-page issue includes two issue games: FALL OF THE PHILIPPINES (solitaire strategic WW2), and 'NAM '68 (two-player tactical Vietnam). Articles in this issue include Streets of Stalingrad: Four New Variations; Torpedo (SimCan) variant; reviews of Kaiser's Pirates, Frontline General, Soviet Dawn,Caucasus Campaign, Cockpit of Europe, Battles Magazine, Algerian War of Independence, Tactcal Wargamer's Journal, June '44; more. Inserts for this issue: Fall of the Philippines map, 'Nam '68 map, one countersheet. Click here (and scroll down) to order. This 52-page issue includes two issue games, and one set of aerial miniatures rules: EINDEKKER (solitaire tactical WW1 air combat), POOR BLOODY INFANTRY (solitaire tactical WW1, and WW2 DOGFIGHT MINIATURES RULES. Articles in this issue include Disign Disasters, Eindekkers and the Fokker Scourge, Firepower: Extended Tours of Duty variant; reviews of Heroes of the Blitzkrieg, Richard III, Elusive Victory, Operation Walkure, First Battle of Britain, Zulus on the Ramparts; more. Inserts for this issue: Eindekker map, Poor Bloody Infantry Reference Card, one countersheet. 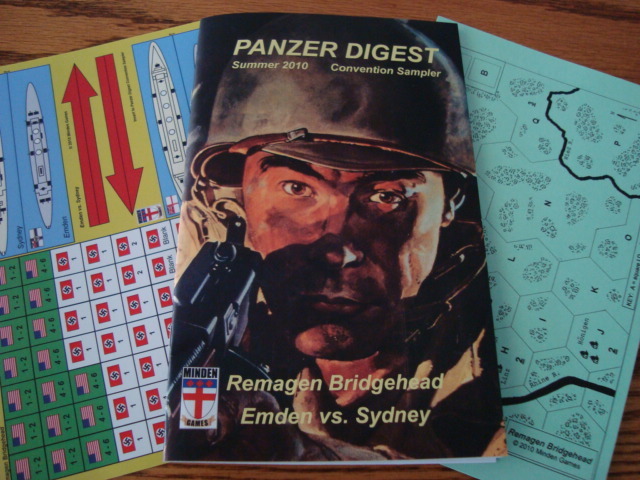 This 32-page special issue was prepared especially for the 2010 summer convention season, and includes two games: EMDEN VS SYDNEY (two-player tactical WW1 naval), and REMAGEN BRIDGEHEAD (solitaire operational WW2, reprinted from Panzer Digest #7). Articles in this convention sampler include From the Editor, A Matter of Context, article reprints of Streets of Stalingrad Russian Map Exits, Fortress Europa: Independent Panzer Brigades; more. Inserts for this issue: Remagen Bridgehead map, one countersheet. 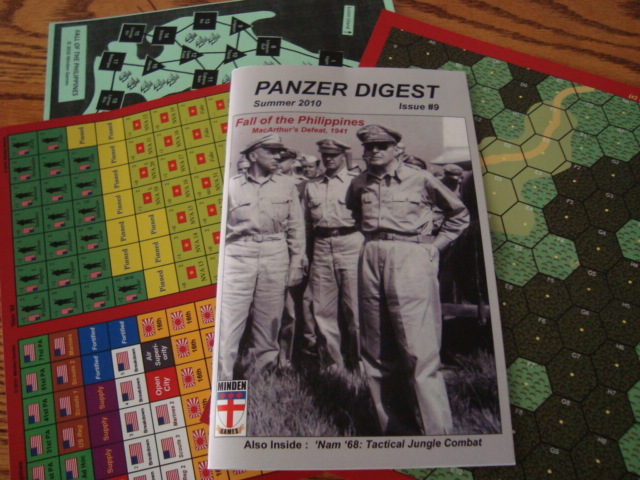 This 72-page special issue contains all the wargame reviews appearing in the first nine issues of Panzer Digest, and was published Summer 2010. Over four dozen reviews in all, divided according to era--Modern, WW2, WW1, 19th Century, Pre-19th Century, Science Fiction, and Magazines. Designs from all the major (and minor) companies are here, including GMT, Columbia, Avalanche Press, Decision, Victory Point, Academy, Omega, many more. Inserts for this issue: None.